Marvellously well written, enjoyed every single page of the book I read. Characters of flesh and blood stay with you for à while, even after you finished reading. I read this book from cover to cover over a day. Page turner you can’t put down for wanting to know what happens next. Well written and totally gripping. An engrossing plot, complex and true to life characters, a lot of room for the reader to be part of the story as it is simply yet elaborarely written and put together. 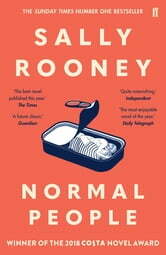 Rooney sensitively and clearly illustrates the intricacies of young people and their lives and hopes.